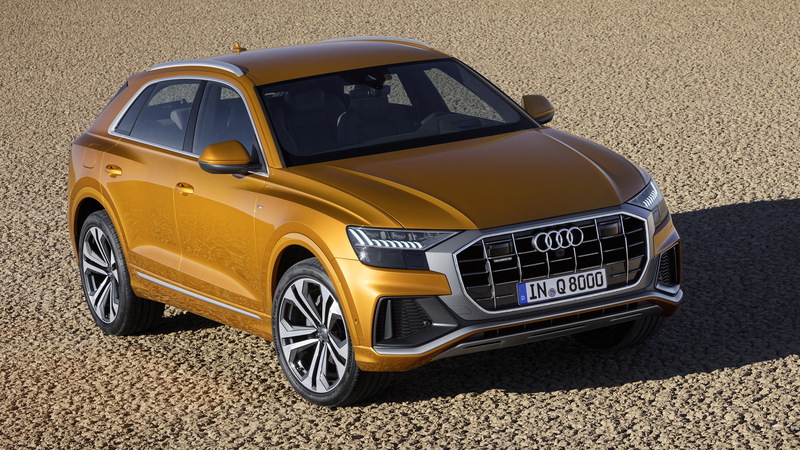 Audi on Tuesday revealed the new Q8. The reveal took place in Shenzhen at an event celebrating 30 years since Audi started its hugely successful strategy of producing cars in China, originally with the 100 sedan. 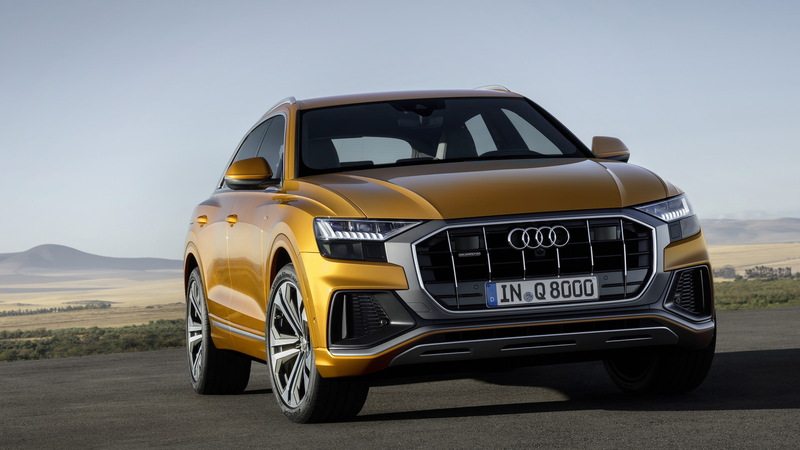 The Q8 is the new flagship SUV of the Audi brand and is set to compete with coupe-like SUVs in the mid-size segment like the BMW X6 and Mercedes-Benz GLE Coupe. Porsche Cayenne and Range Rover Sport buyers may also want to consider the Audi. 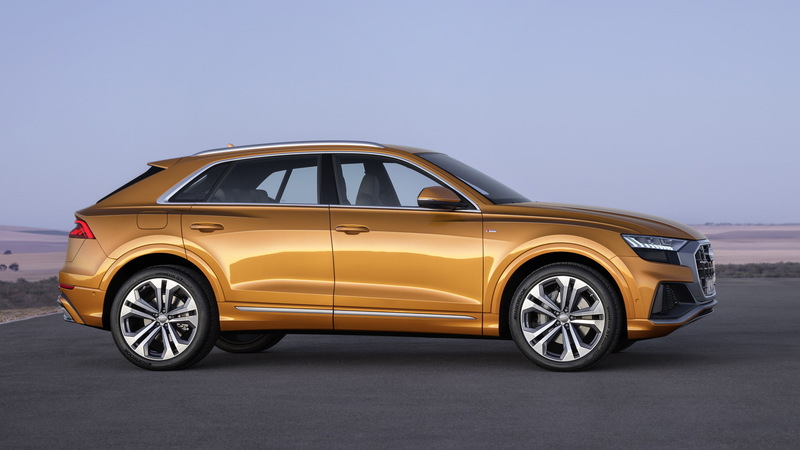 The vehicle sports an aggressive look that Audi says presages the new design for its SUVs. This suggests we'll see elements of the design on other upcoming Audi SUVs like the e-tron and Q4, entering production in 2018 and 2019, respectively. The Q8 is closely related to the Audi Q7, though it's wider and lower. 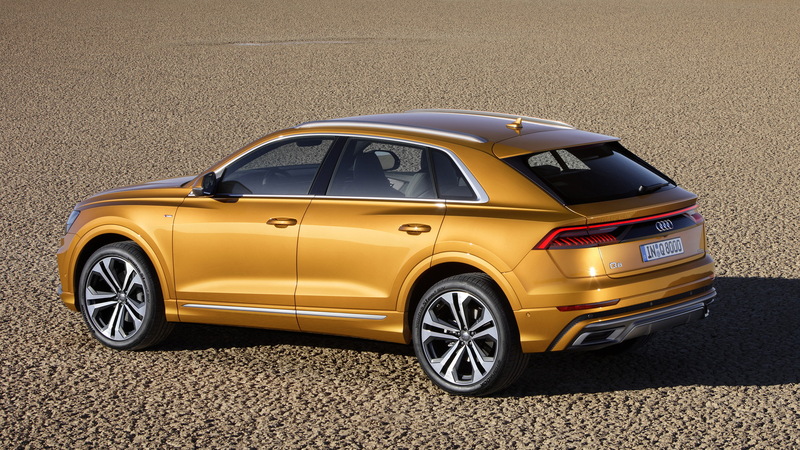 Riding on the Volkswagen Group's MLB platform, the Q8 measures 16.4 feet in length, 6.6 feet in width and has a height of just 5.6 feet. The wheelbase is 9.8 feet. There are two rows of seats, and with the rear row folded flat storage space is a generous 62 cubic feet. The only powertrains announced so far are a pair of 3.0-liter turbocharged V-6es, one gasoline and the other a diesel. 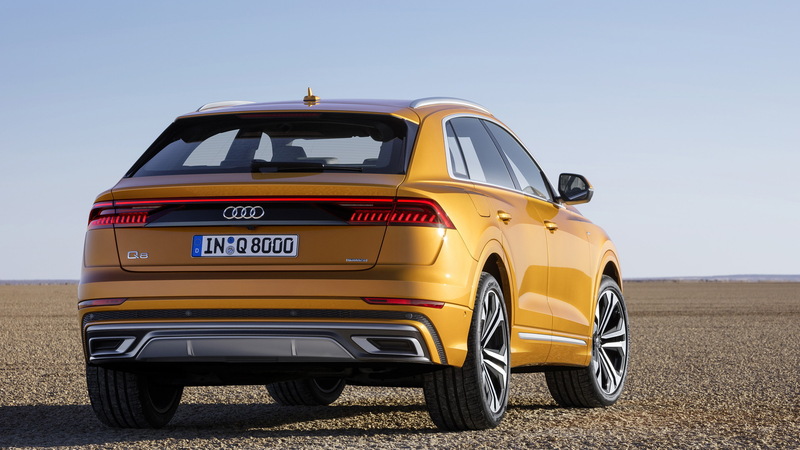 Performance-oriented SQ8 and RS Q8 models with V-8 power are thought to be in the pipeline. All Q8 variants come standard with mild hybrid technology, in this case a belt-driven motor generator that acts as the starter motor and can aid the engine during high loads. It can also recover up to 12 kilowatts of electrical energy under braking, storing it in a small lithium-ion battery. All-wheel drive is standard, with a mechanical center differential that normally splits torque 40:60 front to rear. When required, it transfers the majority to the axle with the better traction. Adjustable dampers are standard and can be enhanced with air suspension as an option. Likewise, speed sensitive steering is standard and can be enhanced with an available four-wheel-steering system. The interior follows the new layout of Audi's recent model introductions, though the Q8 takes on a sportier theme thanks to plenty of piano black surfaces and a thick-rimmed steering wheel. There are three digital screens, two of which sit in the center stack and can control almost every vehicle function. Operation is swift and simple: a tactile and acoustic click confirms when a finger activates a function. Voice activation with natural speech is also included. Production of the Q8 is taking place at the Volkswagen Group plant in Bratislava, Slovakia, where Audi also produces the Q7. Sales will commence in Europe this fall. An arrival in the U.S. is expected late this year or early next.